What are you doing this summer? 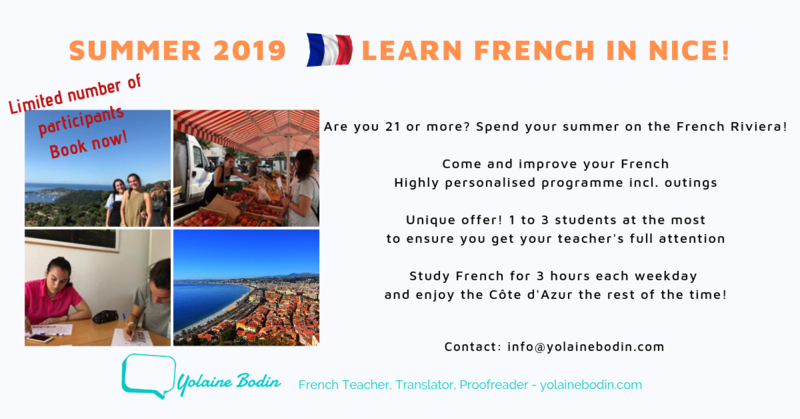 How about learning more French while visiting Nice and the Côte d’Azur? Lessons take place for 3 hours every weekday, i.e. from Monday to Friday. The rest of the time, you can enjoy the French Riviera: the sun, the beach, the sea, the city, the surrounding hilltop villages, Cannes, Monaco… The South of France has a lot to offer and you can be as active or laid back as you wish! Most of all, staying in France while attending French classes is probably the most efficient way to improve your French. You will learn during classes and will be able to use what you’ve just learnt in a lesson outside class. Nothing works better than that! Being in the country, studying and practicing the language with locals in your everyday activities is a sure way to improve. Some of the lessons are spent indoors, studying all aspects of the language: mainly speaking and listening of course, but also reading and writing. Grammar is always included, often seamlessly, in all activities. This Nice French Summer Course is exceptional in that the programme is fully tailored to your specific needs. Classes are private or semi-private: the number of participants goes from 1 to 3 at the most! This way, you are sure to make the most of your French lessons, to have enough time to take part, ask questions and get your teacher’s full attention and time. Learning a language does not need to be boring. I like to help you work in a relaxed atmosphere, which proves to be the best way to learn. Lessons include exercises, games, role-plays and much more. Some lessons mean going out together and practicing in town: asking for information, going to the market and shops, to museums, visiting places. Learning and cultural outings are a full part of the course. You can book for 2, 3 or more weeks! Last summer, two young students stayed for 8 weeks and attended 2 to 3-hour lessons every day. “From the day I arrived in Nice, Yolaine has been like a mother to me. Thanks to her, my French has improved. Her teaching style is really motivating, we’ve watched movies, went on trips around the city and plenty more. Yolaine gets deeply involved with her students and that’s very important for me. Remember, asking for information does not mean getting committed.